I’m Old Fashioned was written in 1942 by Jerome Kern with lyrics by Jonny Mercer for the Columbia Pictures film, You Were Never Lovelier. She begins the song (and the album) unaccompanied and then gradually they add a wonderful big band accompaniment. I start the same way on my recording, a perfect fourth lower (although our version is just voice and piano). I credit her version on the sleeve notes of my album as the inspiration for the unaccompanied start. 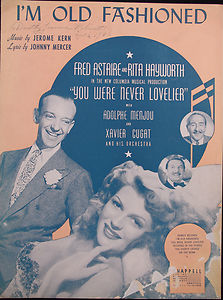 I’m Old Fashioned was sung by Rita Hayworth’s character in the film You Were Never Lovelier before a dance sequence with Fred Astaire. It was the last time the couple were paired together. 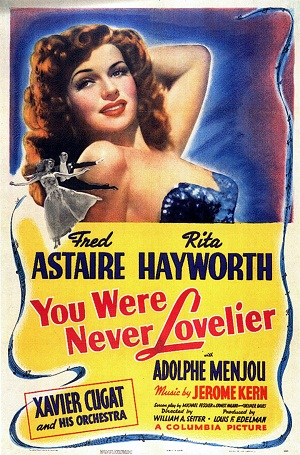 Hayworth reputedly had quite a fine singing voice, but in this film (and most others), her singing voice was dubbed on by Nan Wynn. There she was. Oh yes – a beautiful sight. “Yes, I know,” murmured Rita. We then danced around the mirrored room in impromptu ballroom fashion, as I wanted to get an idea of how we looked together. I kept thinking how extraordinary it was to find myself about to play opposite my freind Eduardo Cansino’s lovely daughter, and I told her so. She laughed. Here’s a clip of Fred Astaire dancing with Jane Russell in her heyday with the voice of Nan Wynn singing I’m Old Fashioned. Nan Wynn was a very interesting singer who earned the nickname “molten mama with the lava larynx”. Her father owned a department store in Wheeling, and the family often visited New York. When she was only sixteen, a retired producer who was staying at the same hotel as the family, heard Nan singing. He booked her to sing at a vaudeville house in Peekskill, and the owner went on to engage her to sing at his other two establishments. 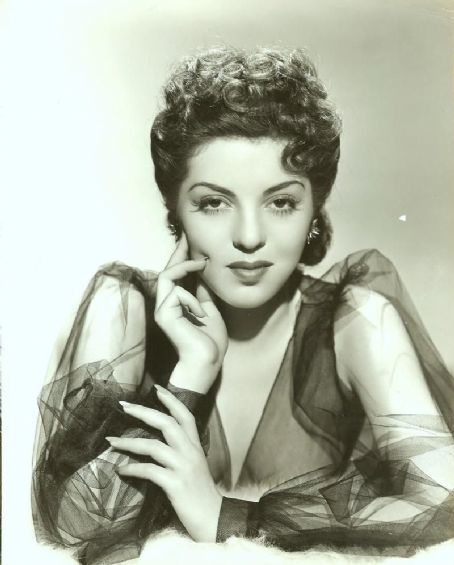 Like a lot of good singers of the time, she honed her craft working as a big band singer and appeared on radio shows like the Hal Kemp Orchestra’s Time To Shine show. She appeared in films such as Million Dollar Baby (1941) often as a nightclub singer. Nan eventually stepped out of the background when she got a starring role opposite William Lundigan in the 1941 film A Shot in the Dark. Her career was tragically cut short in 1949 when she contracted cancer and the surgery to remove a tumor severed a facial nerve and caused her to lose her voice. Nan was very determined and despite medical opinion to the contrary, she regained her speech and facial control by 1955, at which point she was briefly signed to RCA Victor. In 1959 she became involved in the State Cancer Crusade and appeared at the American Cancer Society events for several years. In July 1981, An LA Supreme Court Judge ruled that Rita had to be cared for by her daughter, who bought a flat next door to her in New York, where she arranged the care for her mother throughout her final years. Yasmin went on to become the president of Alzheimer Disease International. Because of the link above to ADI, I was recently contacted by Oliver Clark who has written a very interesting article outlining the long-term effects of alcohol on the brain. It includes a very clear infographic/graphic image that certainly gave me pause for thought! In 1942 when Kern and Mercer wrote I’m Old Fashioned, Johnny Mercer also wrote the lyrics for That Old Black Magic with his long time collaborator Harold Arlen and one of my favourite songs, Skylark with Hoagy Carmichael. I came across a very interesting documentary made by Clint Eastwood on YouTube, which celebrates the life of Johnny Mercer and is well worth watching. I remember we sang an arrangement of his most famous song, Moon River, but what I remember most, was that we were all suffering badly from jet-lag. In between the rehearsal and the show, I decided to take a nap. Somehow, I got am and pm mixed up on my alarm clock and woke from my deep sleep just in time to realize that it was only half an hour until the start of the concert. I had to throw on my dinner-jacket-trouser suit, (both the girls and the boys wore the same first half outfits at the time) slap on some red lipstick and rush down the street in the steamy, southern heat. I arrived at the concert hall very hot and flustered as the orchestra were actually playing their first number. The rest of the group were panicking and wondering where I was. All a bit too close for comfort! 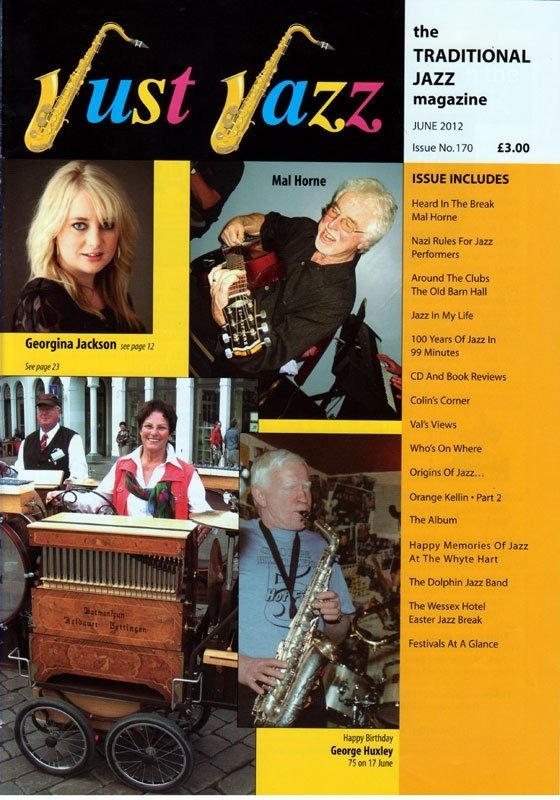 To listen to a clip of my version of I’m Old Fashioned (and the other thirteen songs) just click HERE. I’ll leave you with one of my favourite singers, Tony Bennett, singing I’m Old Fashioned accompanied by Bill Charlap on Elvis Costello’s New Year’s Eve show in 2008. Watch out for the moment at 0:50 minutes, when Bennett gestures to Bill and he plays a bell like chord to mirror Tony’s emphasis of the the word ‘sings’. Class!